Yes, I pretty much just dated myself as a child born in the late 60's, grew up in the 70's with that title. If you're old enough to enough to remember raking the carpet as something on your chore list, then we might be of the same age, especially if you remember having a chore list that didn't end with an allowance! So if you've followed my blog for any length of time, you know that we've been doing cover crops for more than 40 years. 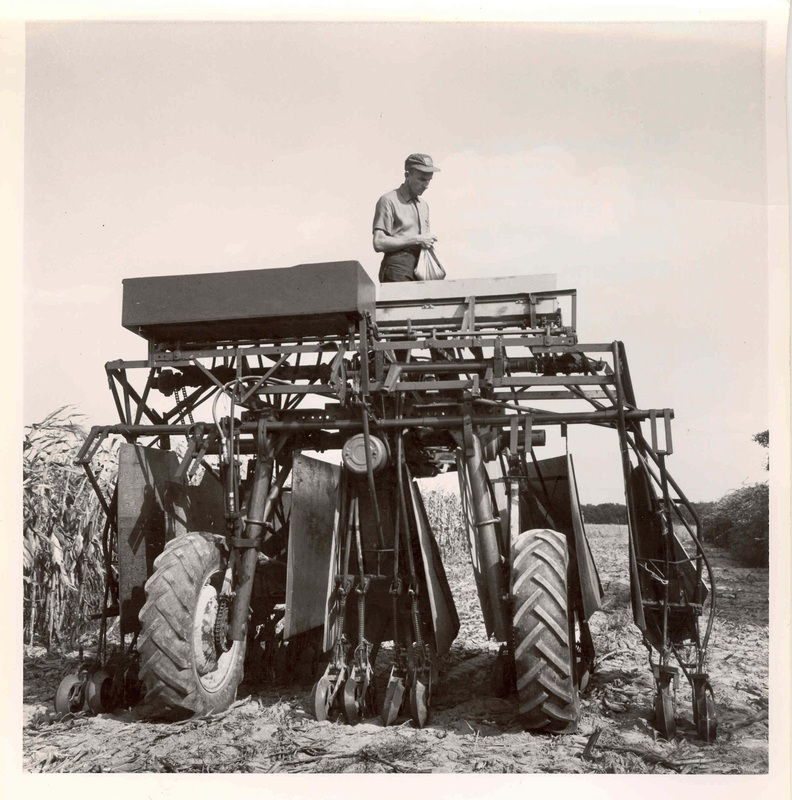 You'll remember this picture from the 1960's of my father in law getting ready to seed No Till cover crops into the corn field to the right of this Hi-Boy cover crop seeder. Cover crops are part of our family farming operation because they are what helps us grow a shag carpet. If you remember walking on a shag carpet, especially after it has been recently raked, you know that the carpet has deep pile, something you could sink your toes into. That's the goal of our soil management program on our farm... to have soil that feels like a shag carpet when you walk on it. In agronomic terms, we call this "tilth". Tilth is the physical condition of the soil that allows for a healthy root system to support plant growth and plant health. Having soil with good tilth or that feels like a shag carpet means that the soil has large pore spaces for oxygenation and water filtration. 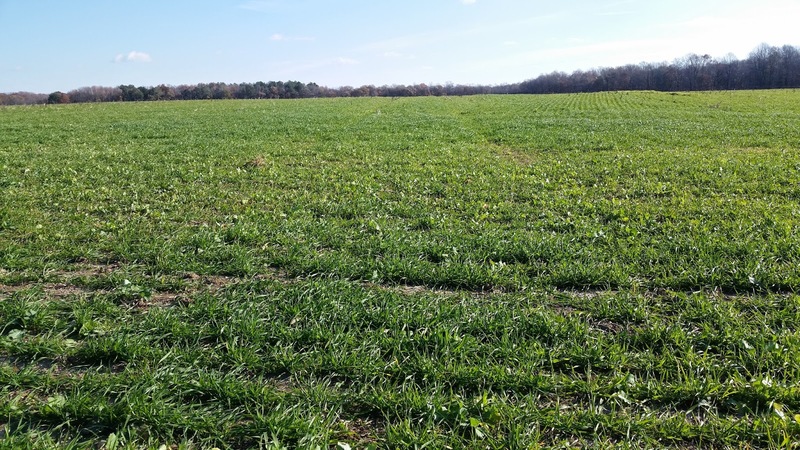 While Maryland farmers use a lot of cover crops in an effort to help reduce nutrients from leaving the soil for the protection of the Chesapeake Bay, that is really a secondary reason for us to use cover crops. We use cover crops primarily to improve our soil health, and specifically our soil tilth. Crimson Clover: We use a lot of this as a slow release nitrogen source for perennial crops like our grapes. Besides being a legume which adds nitrogen to the soil, also provides a lot of biomass when it is incorporated into the soil. This organic matter helps add structure to the soil which helps stabilize the soil from erosion, improves water holding capacity of the soil, and its decomposition adds microbial activity to the soil. Besides that they're a good habitat when in bloom in the spring for attracting beneficial insects. Tillage Radish: I took this picture while combining corn last week. The radish seed was aerial seeded rather than drilled or planted (we no longer have that old fashioned Hi-Boy seeder from the 1960's.) Aerial seeding allows us to spread the cover crop early enough in the late summer or fall to allow for good germination. In order to get a good stand of any crop, you need good seed to soil contact, adequate sunlight and warm temperatures for germination. Today it is 26 degrees at Noon. It is too cold for seeds to germinate at this point. Tillage radish grows a long tap root which creates nice pores in the soil which help break up compaction from driving across fields with equipment, as well as acts as a "sink" for nutrients that the previous crop did not use this season. The radish stores those nutrients in its root. When it winter kills and the ground thaws out, the radish will decompose and release those nutrients back into the soil for the next crop to take up. The aerial seeded tillage radish seen above is mixed with annual rye. It was seeded before we harvested the corn, then once the cover crop is no longer fully shaded by corn, it greens up and gets to work on the soil tilth. Along with decomposition of the corn stalks into the soil, over time, we work to increase the organic matter and create a soft, well structured soil that feels like a shag carpet when you walk across it. This field above has a mixed species cover crop of tillage radish, crimson clover, and barley. It was drilled rather than aerial seeded. 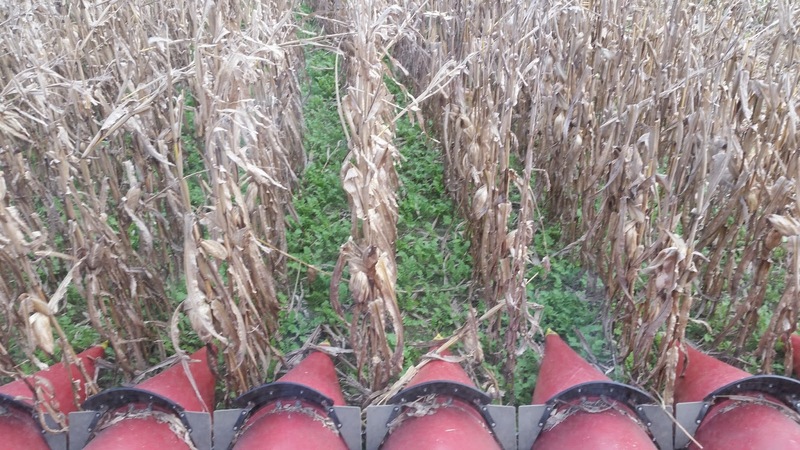 When we do a mixed species cover crop, it is to address several issues. 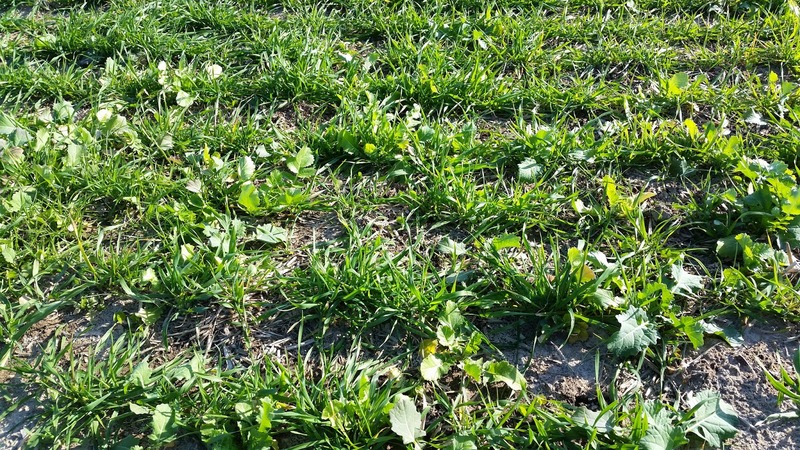 Barley is good a taking up excess moisture and suppressing weeds which combined with the nutrient scavenging of crimson clover and the compaction reduction of tillage radish, is one of our preferred cover crop mixes. So cover crops is only part of the shag carpet equation. The package deal is that soil management is a practice of adding organic matter, reducing compaction, improving the nutrient profile, and working at improving the structure of the soil so that the next season of crops is grown in healthy soils and so that the next generation of our family has healthy soils to continue of family farming legacy. To maintain a profitable family farm, you need to be constantly improving your soils. 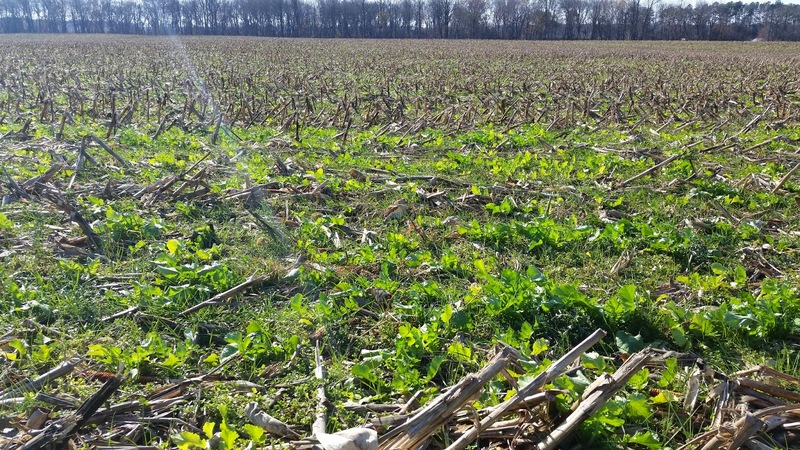 Decades of cover crop management has shown us the benefits to doing so.